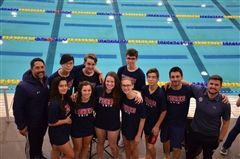 The middle and high school swim teams compete in the winter and are lead by coach Clement Muraro and assistant coach Chuck Caglar. These dedicated athletes work every year to return to the state meet in San Antonio and place high in their respective races. As a relatively new team, the DIS swimmers that are currently competing for the school have laid the groundwork for a long tradition of successful swimmers to follow in their wake. These swimmers did a fantastic job at the annual TAPPS swim meet. Way to go!